Larry Lashbrook is a Florida legend for both his 45 years of master Luthier, set ups, repairs and making high-end, hand made, custom built guitars. Lashbrook is a passionate inventor and musical equipment icon. He has worked with hundreds of musicians. Not only has Lashbrook been a guitar tech for Yngwie Malmsteen for the last two decades but is the go-to guy with his 45 years of skillful guitar experience. At the constant request of close family members and friends Lashbrook has finally begun his journey of producing his own line of guitars. His LTH-1 features are beautiful: a solid carved curly maple body, custom wound passive hum bucker pickups with exotic wood detailed covers, a five-piece curly maple set neck with a compound radius Brazilian rosewood fret board and massive Dunlop 6000 frets. There is no taper to the thin neck shape, and Lashbrook’s signature setup allows low action with amazing dynamic abilities and no trace of the fret buzz. Among the best of LHT-1’s numerous unique feature is the patent pending Lashbrook Tune O Matic style piezo bridge and ebony trapeze tailpiece. Lashbrook’s method of genius design allows the piezo system to create the most realistic acoustic tones by considerable level (the system is available separately). 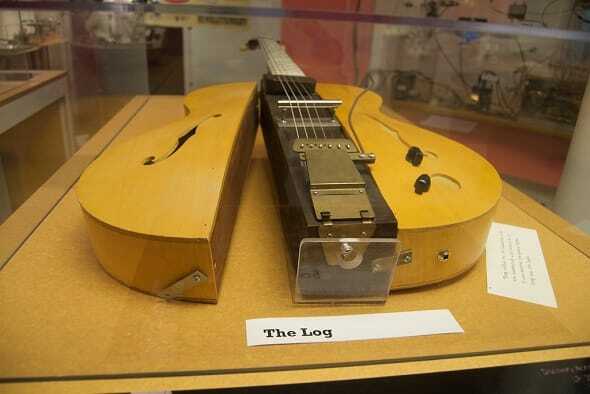 “We consider our Tune-O-Matic style Piezo Bridge to be our crowning achievement,” says master luthier Larry Lashbrook. “You won’t believe the quality and authenticity of natural acoustic tones that we are able to achieve in a solid body instrument.” Passive electronics are also an option to connect the hum bucker and piezo pickup signals to single or dual output jacks. Lashbrook’s commitment to old world craftsmanship and genius innovation places the LTH-1 in the elite of the ultra high end instruments. All of Lashbrook’s experience and love for perfection of equipment truly reflections in his line of guitars. 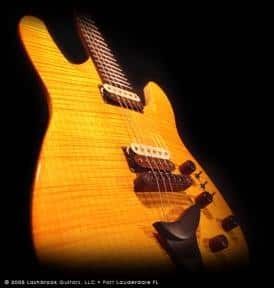 For more information check lashbrookguitars.com.